BREAKING NEWS! I never knew there was such a thing as "British Egg Week" until last week but I've got all egg-cited now. Mention eggs to me and I think of The Great Egg Race (BBC Archives here) and the egg machine that Caractacus Potts introduces us to in the You Two song in Chitty Chitty Bang Bang (you can stop trying to work out how old I am now). British Egg Week runs from 1st to 7th October 2012 so, knowing how egg-cellent I am when it comes to cooking (! 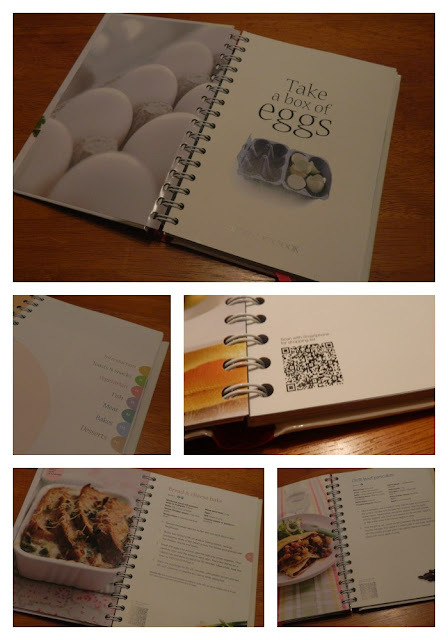 ), The British Egg Information Service have sent me their new recipe book - Take A Box Of Eggs. It contains 100 recipes that even I can't mess up! But, I'm not going to try some of the recipes at weekend. Instead I'm going to present the book to my 19 year old son who completely fits into the YouGov statistic (from May 2012) which states that 35% of 18-24 year olds have never poached an egg and 21% have never made an omelette! If you ever read my post called "Bacon, Sausage, Egg (Toast Optional)", I can tell you that he's not improved one iota! He's going to have some intense training and I'll let you know how he gets on. Take A Box Of Eggs retails at £9.99 and you can purchase it from all milkmen and from www.dairydiary.co.uk. For the month of October it is available from the British Egg Week website for a reduced price of £7.49.